In a major road mishap, two persons lost their lives leaving thirteen people including children injured in Udalguri district of Assam on Sunday. 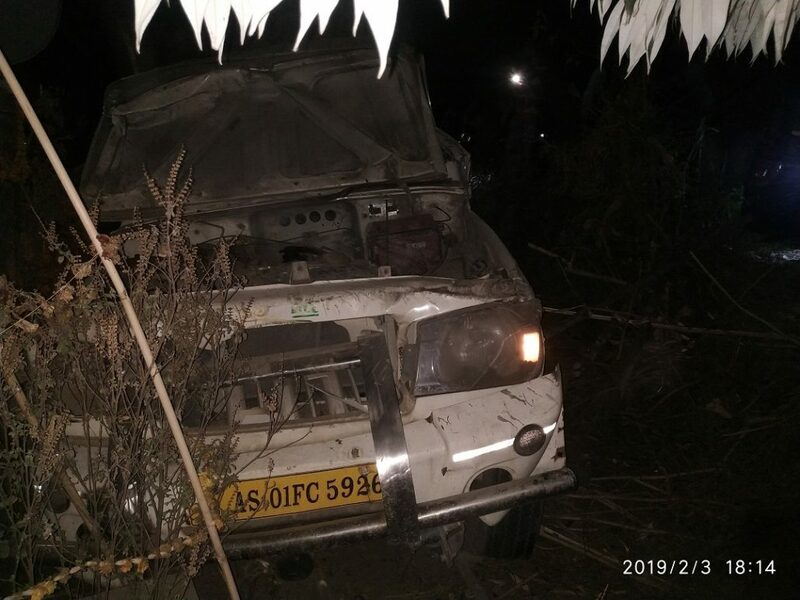 The accident took place when the Bolero pick-up vehicle, bearing registration number AS-01-FC-5926 carrying the picnickers back from Bhutan to their home in Bamunjuli tea estate lost control in Samrang area in Udalguri late Sunday evening. The injured were immediately rushed to Tangla CHC where Pankhairas Toppo (60) and Augustus Munda (32) were declared brought dead. The injured after preliminary treatment were referred to Mangaldai Civil Hospital. Those injured have been identified as Soma Munda(30), Gangu Orang(26), Ritu Nayak. (35), Shyam Nayak (30), Tinku Nayak. (35), Bikram Porja(45), Soma Munda(26), Loresh Tirkey(35), Elena Deka(34), Bishnu Porja(29), Dipika Nayak (24), Nirmal Munda(25), Niwlash Orang(26) and Budhwa Munda(35) as informed by attending doctor, Dr H Das of Tangla CHC. All of the injured, mostly tea garden workers are residents of Bamunjuli TE and were returning from picnic tour to Bhutan. The driver of the vehicle has reportedly fled the scene after the incident.